The more I fiddle with the mini Siphon the more I like it. First mini Siphon I did using 15mm (1/2 inches) PVC pipe and fittings, this size is finicky and prone to failing. I then resort to increase it size to 20mm (3/4 inches) as used on my single barrel kit sometime last year and had it running without problem since. This smaller size siphon was not really fully tested, since it just work and I assumed that it function as its bigger brother that I normally use. 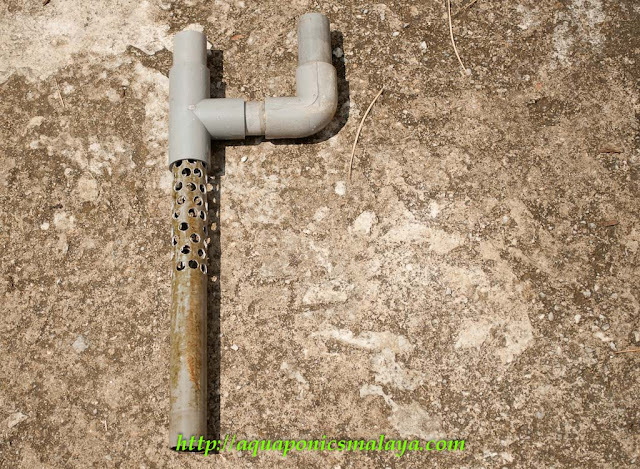 Being small has its advantage, cheaper, easier to make and together with less water inflow requirements makes it ideal for small or solar powered system. Before it can be deployed successfully, I need to make sure that it is able to tolerate varying water inflow. Otherwise it can't be use and would be a problem in maintaining it to work properly. I have tried various water inflow, so far the result is encouraging. More test need to be done and I'm aiming to retrofit one of my bigger growbed to use this siphon. 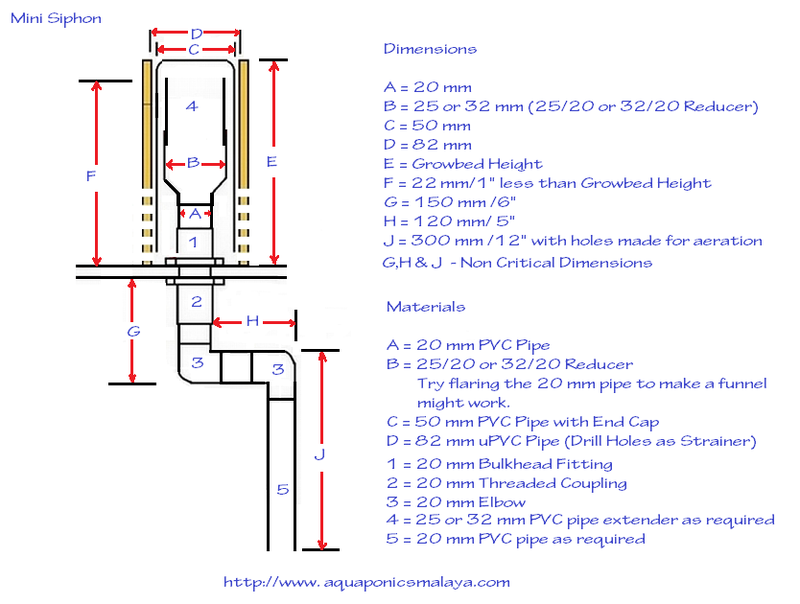 Below diagram of mini siphon if anyone interested in making one. Only dimension has change, the rest is identical to its bigger brother. I have tried with 32/20 mm reducer it work. I am currently trial run it with 25/20 mm reducer, if this smaller reducer with varying water input works, then it would be better to use this size. With smaller size reducer used, if you can't get a reducer then its possible to hot flare the 20 mm (3/4") PVC to make a funnel on the stand pipe. The dimension between top of stand pipe to bell should not be less than 1/2" about 12mm. If less than this over time as the siphon get algae build up it may fail. Making it not less than this length will ensure trouble free operation. If you find that its difficult to stop a siphon this may be the problem, try increase it. Insufficient distance can cause difficult to start, and if started difficult to stop. 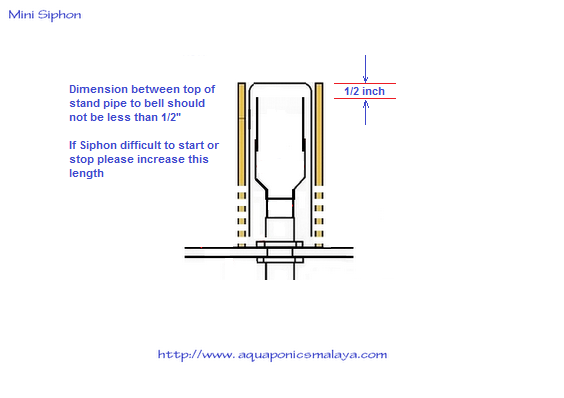 On the 25 mm stand pipe siphon (its bigger brother), if reducer used is 32/25 mm then the 50 mm bell can be use for it too, making the 25 mm and 20 mm Siphon share the same outer dimensions. Photo above showing the 25/20 reducer on the stand pipe with 50 mm outer bell. The reducer is placed on top, this was a quickie job, ideally I will make its as short as possible then use 25 mm pipe as extender to adjust water level. I will try making a flared funnel from that 20 mm pipe, its its work then its even better. Most complaint I received is due to the non availability of the reducer in some parts of the world. 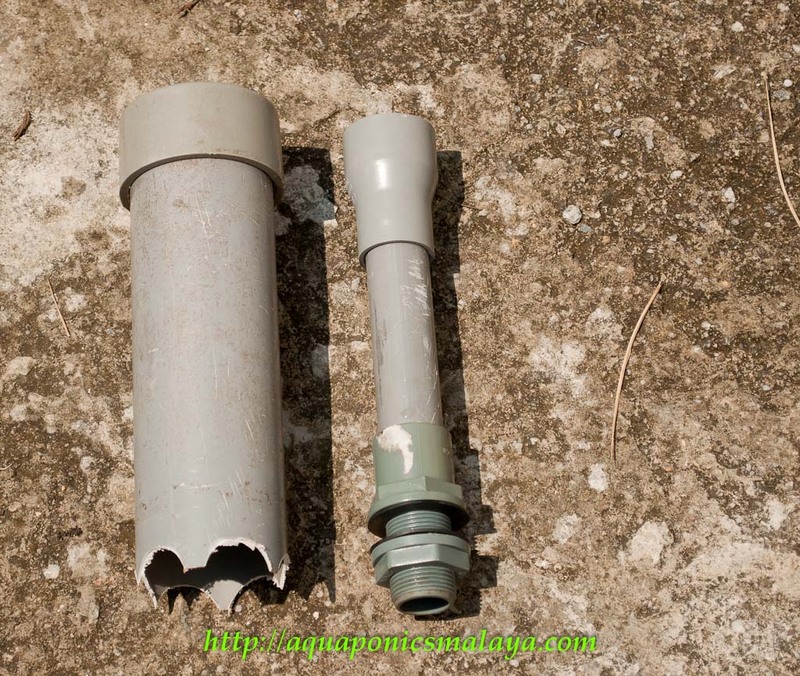 Making a flare funnel is an alternative for those that having this problem. Above with 32/20 reducer in place. 25/20 mm reducer used, with 32/20 mm reducer as comparison. Test conducted so far so good. Later this afternoon I will get more pebbles for my growbed and get it done properly. Above a "High Water" siphon outlet that I am also testing, its not a requirement that you use this type. High Water outlet in action below, more job need to be done. Water overflowing the aeration breather. The double elbow job as below do fine for most installation but I need the high water outlet due to my water level problem. Its only 6" clearance between my growbed and the highest water level point. I know the mini siphon works after few days of trial, however the longer time needed to fully test it to see what plant roots will do to it if operate at prolong period. So I will monitor it for 3 months. Pebbles loaded growbed done, now for more serious test. Then it would be a combi, combination of bell and loop. I did experiment with that arrangement before, but its not necessary. Will only add complication to a siphon. 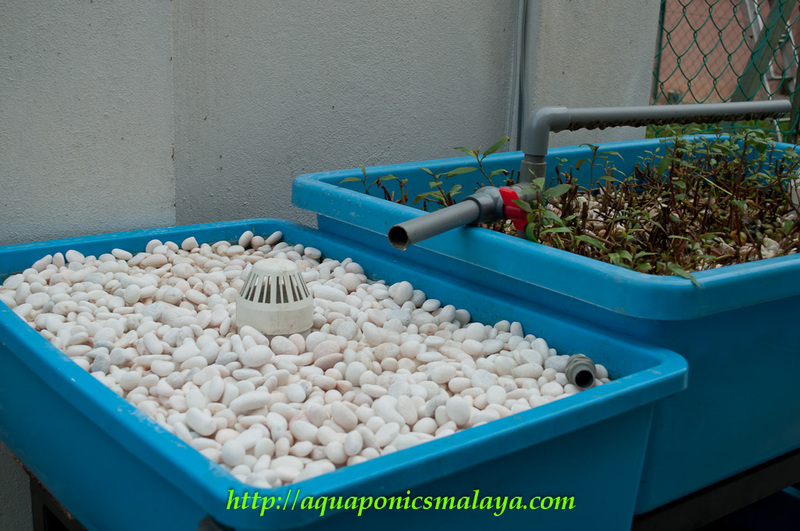 What I'm trying to do is to make it as simple as possible so that who ever wanted to start Aquaponics will not get scared with its mechanism involved. IC, that method will make a siphon only sensitive to smaller range of water input. What's important is to get a siphon able to operate across broader range of water inflow. 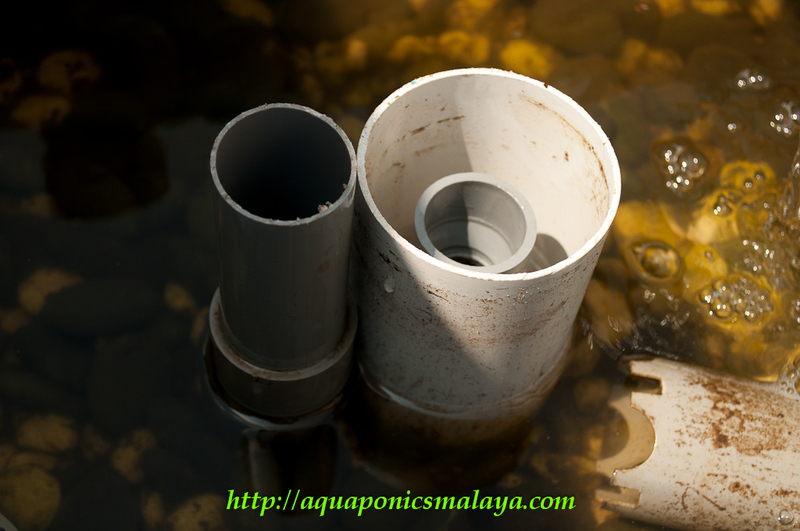 If the siphon is wrongly tweak, it may works good at low water in, but may not operate well when increase flow occur. As an experiment its okay to try, but to deploy in the fields it needs a system that is "idiot" proof to works. Because there will be many people and with various or nil technical background may be interested with Aquaponics, I am trying to make it easy. 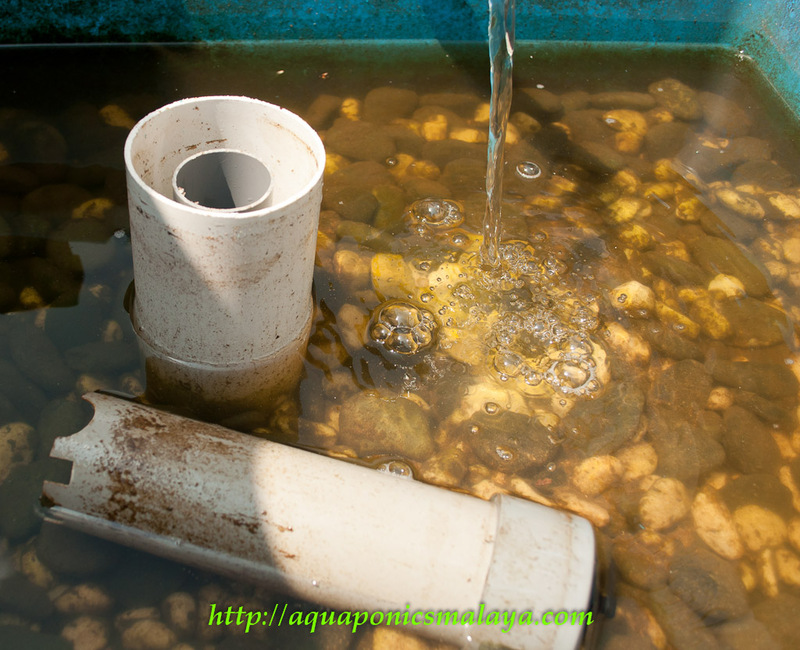 That method was tried with normal straight stand pipe siphon during the early days of Aquaponics to make siphon more reliable. As time goes by the Breather Tube and my design manage to survive the test of time. I see, so the double bends and the reducer already provide enough backpressure to help the siphon. Now that you mention it, you don't use any breather tube on your siphons do you? Does that make the tweaking harder or easier? Mahfudz, no breather required on this design. No tweaking required on it, most of the time it just work. 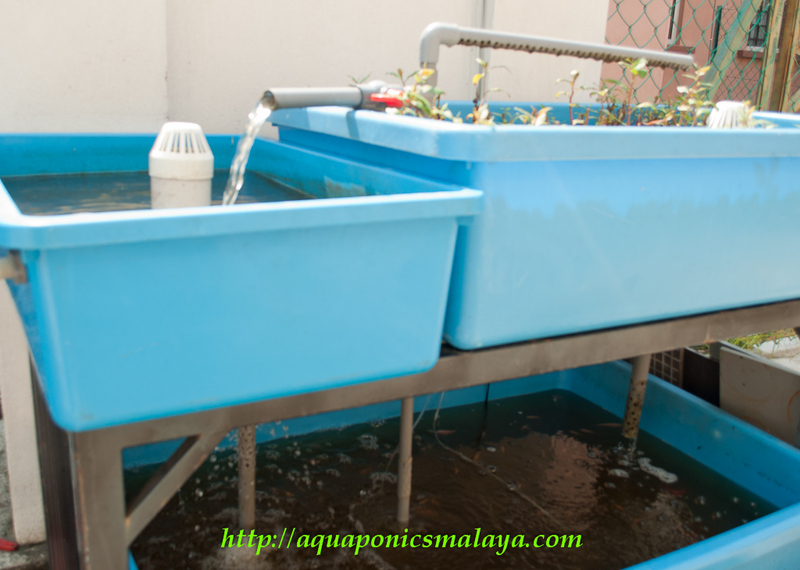 Planning to start small aquaponics in my house using IBC or blue barrel. Would you recommend using coco fiber as media? I don't recommend coco fibre as the main media. If you use pots within the growbed it's ok. Normally those fiber will decay and can cause problem to pump and water quality. Pebbles is still the cheapest and easier to manage, just that its heavy. actually not the whole growbed using media.. it will be combination of pebbles and coco fibre, not the coco peat. i am planning to use ibc tanks for the growbed and the fish tanks. Hi Nelayan Langkawi, any particular reason why you wanted to use coco fibre ? Thanks for a great blog and your work with developing the aquaponic-technology. I have learned a lot. It seems that the 20 mm bell siphone is working very good and i was going to make one:) But here where I live -Stockholm Sweden- it´s imposible to find the 20 mm pvc pipe :(. I am working with a non-profit urban farming project here in Stockholm. (Animamundi Collaboration Stockholm).We are, among other things, starting an aquaponics-system to show and spread aquaponics (and other urban food production systems that anyone can do). My question: We have built an ibc-aquaponics system and now need a bell siphone. Is it possible to buy a 20mm bell siphone from you. It would be moast appreciated and of course we would display that you are the constructor of the siphone. thanks for your comment. Its not necessary to use 20mm pipe, these figure are just what I have over here. If you could find similar size pipes and similar reducer it will work. One thing about the 20mm siphon is, the outer bell and strainer is small. This may make cleaning difficult since its difficult to get your hand inside it. I am not in a position to make any at the moment, due to my busy schedule and most equipment I am packing for safe keep during renovation. 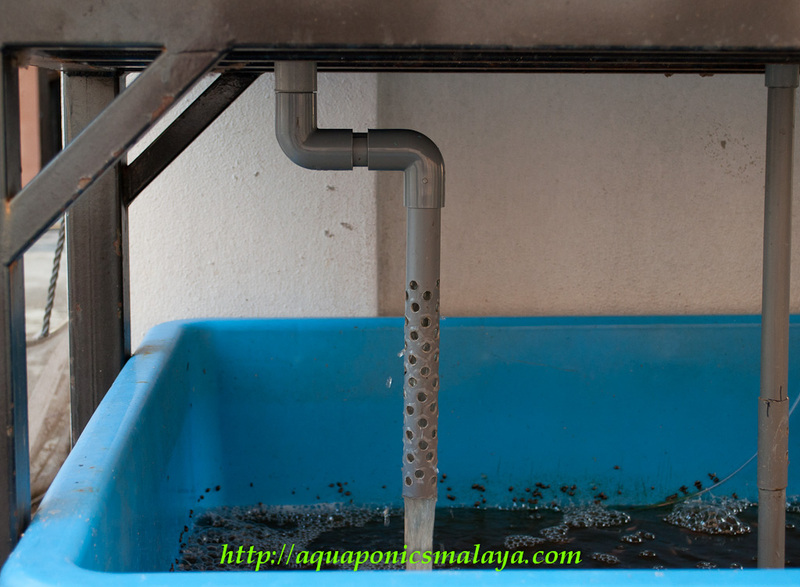 You can try experimenting using similar size pipes and fixtures, and I am confident it will work. And thanks ones again for sharing your knowledge and contributing to the green movement. From what you have written it's clear that you prefer the mini-siphon. I have a question though. Does the smaller siphon limit the size of the grow bed at all? I am currently in the process of building a 6 foot by 4 foot grow bed and was wondering if the mini-siphon would be able to handle that size. Would I be better to build the larger version that you have described elsewhere? Thanks SO much for all your efforts and the contribution you are making. It is appreciated all over the world. Firstly many thanks to you for taking the time to produce such a wonderful resource for all of us new to the game. I am planning my first aquaponics set up and would like to have some grow beds at waist height and some near the ground (for tall plants), I would like to try having the siphon from the top grow bed drain into the lower grow bed, the lower grow bed would then have a trickle drain into the sump tank. Have you ever tried this type of setup ? There might be a problem with the amount of nutrients reaching the second tank? just a thought! Hi Affnan. Thanks so much for all your work.I have just today `found` you! 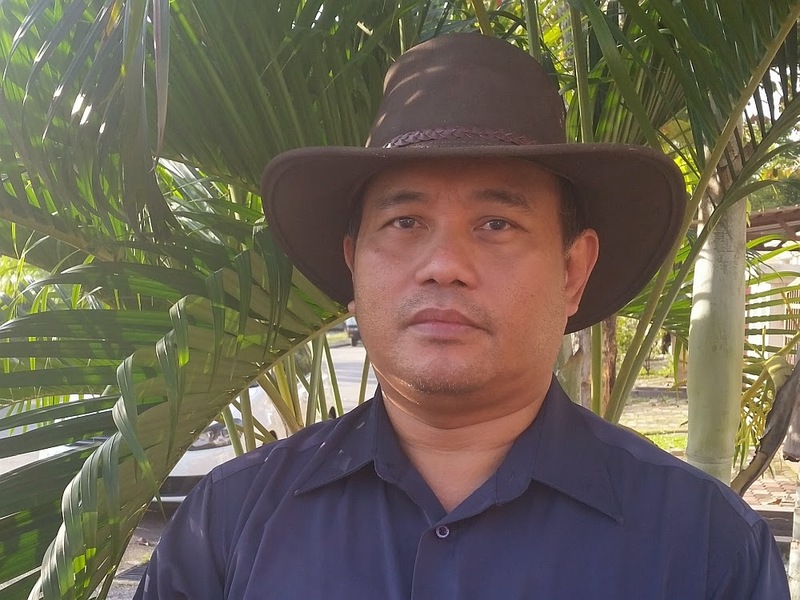 I am hoping to build your type of system at my wife`s place in the Philippines. It will help greatly in the provision of vegetables and fish ect. I have seen video`s of people keeping livestock over these tanks as well as veggies. I presume it would be necessary to up-rate the rate of flow in order to cope with the extra amount of waste? Good luck with your house extending!! Hi Again, just read your comment on bugs.One thought was nicotine from cigarette butts, which i use on my plants. But it is very toxic to fish, so a definite NoNo. Plant as a border and interplant. Attracts these beneficial insects: Hover flies. Repels these Harmful Insects: Colorado Potatoe Beetles, Root nematodes, Mexican bean beetles, aphids. 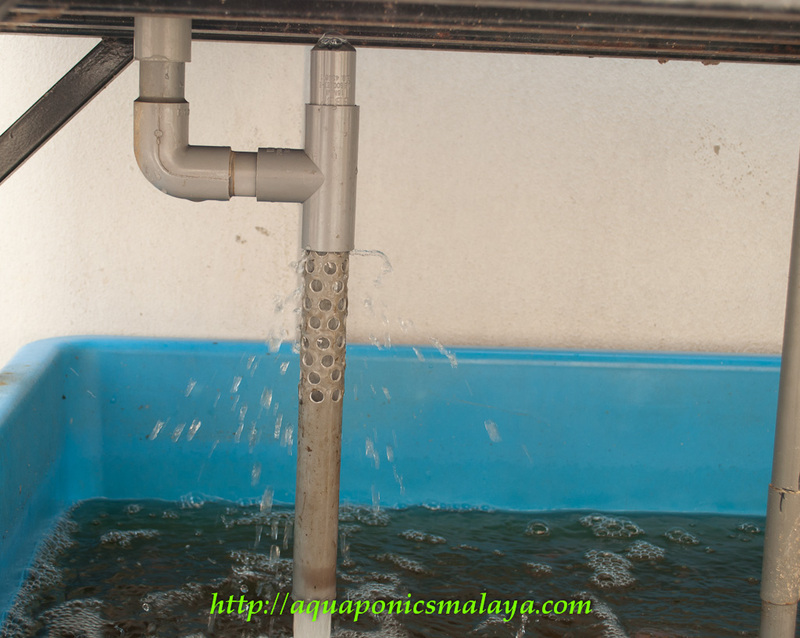 Hi Affnan, We just put our first growbed together and tested the bell valve. It worked, first time out. Thank you for showing us how! Hi, 20 mm is 3/4 inches. 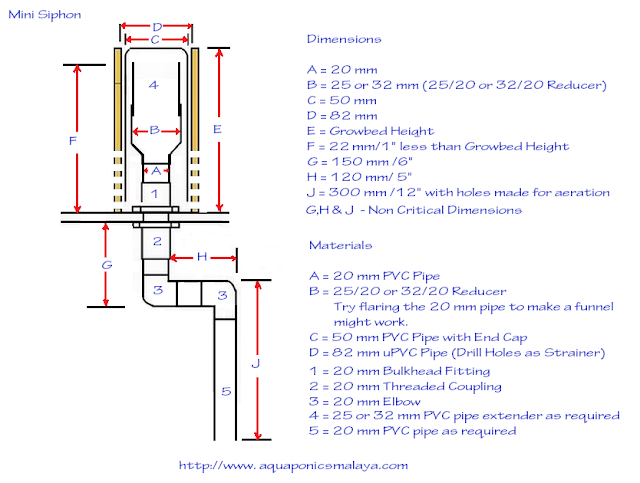 Do you have the diagram for the 1/2 inch 13 mm system you made work? I'm trying to get it to work so I can use it as a science experiment fr the 5th graders I teach. for the bottom of your release pipe . Must you use a s- shape? would it make a difference if straight down? Apart from that S shape we can use an L shape, a straight down can be use but need some restriction to provide back pressure. Straight down will make a different.